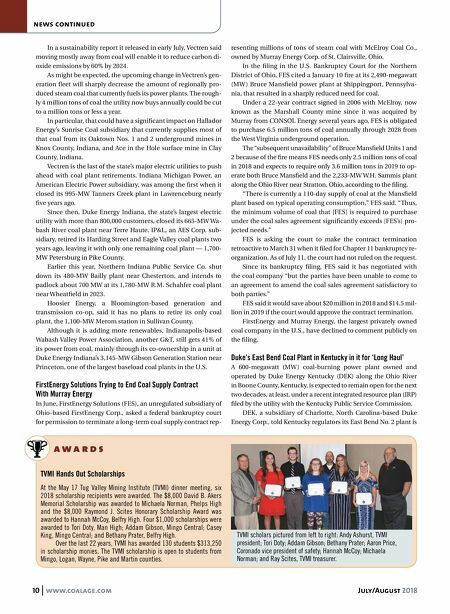 July/August 2018 www.coalage.com 11 news continued an "efficient and well-controlled coal unit" that "effectively shields DEK customers from the negative impacts of high gas prices." It added that favorably low natural gas prices coupled with low coal prices and a lack of legislative action to reduce carbon dioxide emissions "would create an environment in which East Bend 2 would continue to operate profitably throughout the planning period." Until the latest IRP, a 20-year planning document, was sub- mitted in late June, there had been speculation about whether DEK would keep running East Bend for the long haul or, like so many other utilities in the region, set a date over the next few years for the plant's retirement. As coal plants go, East Bend is roughly middle-aged. It was built near Rabbit Hash, Kentucky, in 1981, making it 37 years old. DEK spokesman Lee Freedman reaffirmed information in the IRP, saying East Bend is "going to go for the long haul." That is music to the ears of embattled steam coal producers in the region that are competing in a smaller market as coal plants are shuttered. Earlier this year, Duke disclosed it is purchasing 850,000 tons of high-sulfur Illinois Basin (ILB) barge coal in 2018 for East Bend from Tulsa, Oklahoma-based Alliance Resource Partners, one of the largest coal producers in the ILB. DEK and Dayton Power & Light Co., a subsidiary of AES Corp., jointly owned East Bend before Duke purchased the portion of the plant it did not already control from DP&L for $12.4 million in 2014. East Bend's sulfur dioxide scrubber was upgraded in 2005. EPA Approves First State Coal Ash Permit The U.S. Environmental Protection Agency (EPA) approved Okla- homa's application to operate a permit program for disposing of coal combustion residuals, or coal ash, in landfills and surface impoundments. This approval makes Oklahoma the first state in the nation to run a federally approved coal-ash permit program. "This historic announcement places oversight of coal ash disposal into the hands of those who are best positioned to over- see coal ash management: the officials who have intimate know- ledge of the facilities and the environment in their state," said Scott Pruitt EPA Administrator at the time of the announcement. "Oklahoma is leading the way for other states to establish state coal-ash permit programs, and EPA stands ready to work with each and every state to improve coal ash management." Oklahoma Department of Environmental Quality Executive Director Scott Thompson said the department incorporated the federal rule into its state permitting-rules program more than a year ago. "We have the knowledge and expertise to consider unique and varied local concerns, which will ensure that the program continues to be successful and protective of human health and the environment," Thompson said. Prior to the decision, electric utilities in Oklahoma were re- quired to directly implement the requirements of EPA's 2015 coal ash rule without the technical assistance or oversight provided under a permit program. The Oklahoma Department of Environ- mental Quality (ODEQ) can now process permit applications and enforce permit violations for existing coal ash units and any fu- ture units in Oklahoma based on state law requirements rather than EPA's federal rule, except for those located in Indian Country. "Today's action provides much-needed regulatory certain- ty to facilities in Oklahoma," the EPA said in a statement. 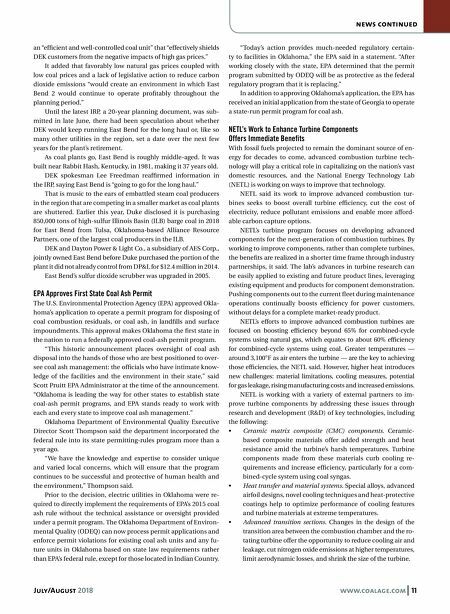 "After working closely with the state, EPA determined that the permit program submitted by ODEQ will be as protective as the federal regulatory program that it is replacing." In addition to approving Oklahoma's application, the EPA has received an initial application from the state of Georgia to operate a state-run permit program for coal ash. NETL's Work to Enhance Turbine Components Offers Immediate Benefits With fossil fuels projected to remain the dominant source of en- ergy for decades to come, advanced combustion turbine tech- nology will play a critical role in capitalizing on the nation's vast domestic resources, and the National Energy Technology Lab (NETL) is working on ways to improve that technology. NETL said its work to improve advanced combustion tur- bines seeks to boost overall turbine efficiency, cut the cost of electricity, reduce pollutant emissions and enable more afford- able carbon capture options. NETL's turbine program focuses on developing advanced components for the next-generation of combustion turbines. By working to improve components, rather than complete turbines, the benefits are realized in a shorter time frame through industry partnerships, it said. The lab's advances in turbine research can be easily applied to existing and future product lines, leveraging existing equipment and products for component demonstration. Pushing components out to the current fleet during maintenance operations continually boosts efficiency for power customers, without delays for a complete market-ready product. NETL's efforts to improve advanced combustion turbines are focused on boosting efficiency beyond 65% for combined-cycle systems using natural gas, which equates to about 60% efficiency for combined-cycle systems using coal. Greater temperatures — around 3,100°F as air enters the turbine — are the key to achieving those efficiencies, the NETL said. However, higher heat introduces new challenges: material limitations, cooling measures, potential for gas leakage, rising manufacturing costs and increased emissions. NETL is working with a variety of external partners to im- prove turbine components by addressing these issues through research and development (R&D) of key technologies, including the following: • Ceramic matrix composite (CMC) components. Ceramic- based composite materials offer added strength and heat resistance amid the turbine's harsh temperatures. Turbine components made from these materials curb cooling re- quirements and increase efficiency, particularly for a com- bined-cycle system using coal syngas. • Heat transfer and material systems. Special alloys, advanced airfoil designs, novel cooling techniques and heat-protective coatings help to optimize performance of cooling features and turbine materials at extreme temperatures. • Advanced transition sections. Changes in the design of the transition area between the combustion chamber and the ro- tating turbine offer the opportunity to reduce cooling air and leakage, cut nitrogen oxide emissions at higher temperatures, limit aerodynamic losses, and shrink the size of the turbine.